This 55" Samsung UN55LS03N 4K Ultra HD Frame TV from RC Willey is not only a television, it is a piece of art. Samsung UN55LS03N 55 Inch 4K Ultra HD Frame TV is rated 4.6 out of 5 by 18. Rated 5 out of 5 by amsw We love it We've had our FrameTV up on the wall for about a month now. We love just about everything on it. The installation was pretty straight forward. The only two minor complaints during installation was that my package only received hardware to mount in concrete wall for some reason. So I had to get some different lag screws. Also, it wasn't clear to me in any documentation online prior to receiving, but the model we bought does not require any 120V plug behind the TV. Previous models may have required it (based on some YouTube videos), but it was a nice surprise to not have to install a recessed receptacle for 120V power. The One Connect cable was the only cable i had to route down the wall to the OneConnect Box. The mounting plate was very straight forward. The OneConnect Box requires the 120V plug in. It doesn't seem like a big deal, but the Frame TV really opens up the space. My wife said we'd never get a 'big' tv for our living room unless it didn't look like a TV. Being tight to the wall does open the space up. And that 'black rectangle' is no longer ever present except while we are all sleeping. The sensor turns on the art mode in the morning when we walk into the room. My wife loves the ArtMode. There are a lot of options in their Library but I hope they expand the art offerings as well. We don't geek out on TVs--our last TV is an 8-year old Samsung that still works well--so I may not be the best to review the picture and audio quality, but the picture is incredible to me. The audio seems great as well, though I'm no audiophile either. The SmartThings software on the FrameTV is very well done and smooth even while switching through various streaming services. The remote is simple to use and very straight forward. I haven't had much luck with the Bixby voice navigation, though that's not too important to me. The SmartThings software apps were easy to download. The only one that I couldn't find that I've used on other TVs was the PBS app. But it has Sling, Amazon Prime, and Netflix and they are so smooth (better than a fire stick). The only two minor complaints that come to mind are: 1. The SmartHub has an internet browser, but we had difficulty in viewing some things including videos (Flash??). 2. The SmartHub has apps like Amazon Music and works well. But you cannot play music and have your FrameTV in ArtMode. That would be my biggest request of Samsung to allow music to play through the TV and still have ArtMode. The OneConnect Box was able to be installed 'remotely.' which is ideal. It does put off some heat--simliar to what a laptop would, so i'm not sure how much airflow around the unit it needs if you were to hide it. We did buy the light wood 'frame' as well. And it really does simply 'snap' on magnetically and lines up very well. We love it. This is my first ever review of a TV. Although it's only a month old, we are very satisfied with the purchase. Rated 5 out of 5 by kkinaz Sweet Vision Wow Folks, this TV is so awesome looking on the wall and the picture quality and sound is superb! I almost purchased a soundbar but, you do not need it. I have cox and it's a tad confusing talking and getting use to the frame remote. But, I will master it. The frame mode is wowzer as I have Monet's water lily pond with a royal blue mat...stunning! It does look like a painting. The installer hid the line in the drywall. I wish that I had the room for a 65". My home is smaller so, the 55 is perfect and with 0% financing even better. You can and will not find a better qled tv. The competition does not even come close with the picture and sound AND they do not have the frame mode. Thanks Samsung!!! Rated 5 out of 5 by Elafriend Frame TV is an elegant update for the living room We have always had great experiences with past Samsung TVs in our own home and opted to try the Frame TV to replace my Mom’s failing plasma (not Samsung) that she’s had for years . Set up was super easy and fast. Was happy to be able to clean up all the cables with the One Connect box. The color is vibrant and the picture quality are such an improvement over my Mom’s previous TV. 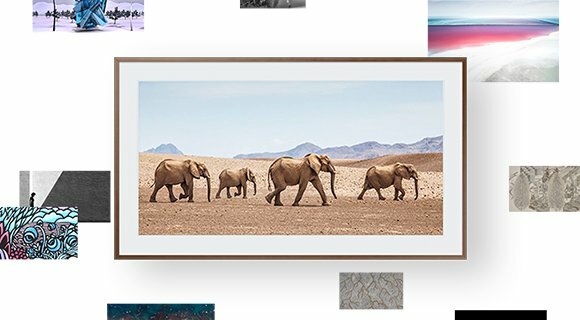 We really love being able to showcase family travel photos in the Art Mode! Rated 5 out of 5 by Danao888 High quality and great value I purchased the Samsung 55” UHD frame TV for my office and love it! The smart remote and voice assistance make this TV easy to use. It is super slim and hangs very close to the wall, customizable frame and Art Mode make it look like a beautiful piece of art - not an eye sore. I use this TV for presentations and education (and of course to watch Netflix) the picture is amazing from any angle in the room, people always comment on how great it looks. Rated 5 out of 5 by ArtAficionado i've become a fine art expert i've had this samsung frame tv for a couple of weeks, and i love it. initially i just wanted a great smart 4K UHD tv with HDR, but then i discovered the frame tv and a whole new world opened up. first of all, yes, this is a great 4K UHD tv. the picture quality is awesome and the ultrawide viewing angle allows me to see that awesome picture from anywhere in the living room. second of all, after some initial challenges (operator error), the set-up was pretty painless. i love the one connect box because i could easily hook everything up to the tv without messing around behind it. and the invisible connection is, surprisingly enough, invisible. i forget that there is even a cord because it so perfectly blends into my wall. the smart remote is so simple and easy to use as i toggle back and forth between live tv and streaming. and last, and most importantly, i LOVE art mode. i signed up for the free trial of the art store and will definitely keep this subscription. when the tv is in art mode it is so stunning. it's also a lot of fun to redecorate the room every day just by changing out the art. it looks natural and real - to be honest, i kind of thought this would be just a really large digital frame, but it isn't. i'm very impressed and so happy with this purchase. Rated 5 out of 5 by NYtoNE Beautiful tv/work of art I love my new 55" Samsung 4K UHD The Frame Smart TV. Right out of the box, I was surprised to see how thin it is. It comes with a no gap mount kit to hang the tv on the wall without adding any extra bulk. It comes with an One Connect box that connects to the tv by a thin “invisible” wire, so it’s barely noticeable. All other devices (dvd player, cable box & gaming system) are connected to the One Connect box as well. No more unsightly tangle of wires hanging from the tv and the One Connect box can be tucked out of the way. The whole look is much cleaner. Setting up all the features on the tv was quick and easy using the sleekly designed Smart Remote. The picture quality on this tv is amazing. It’s so sharp and crystal clear. My favorite feature on this tv is the Art Mode. I love that this tv serves two purposes, as a source of entertainment and as an artwork. The artwork selection that came with the tv are all beautiful. I ended up picking a landscape one that went with my décor. I enjoy looking at it whenever the tv is off. It really does look like a framed work of art. The only negative is the cost of the customizable frames. The frame of the tv comes in a basic black color. You can change the color of the frame with customized magnetic bezels that snaps on over the original frame. There are 3 color options offered: white, beige, and a walnut finish. The walnut finish would look great in our home, but it’s a bit pricey for what it is. All in all, The Frame TV is a great tv for all that it offers in terms of features and in looks. 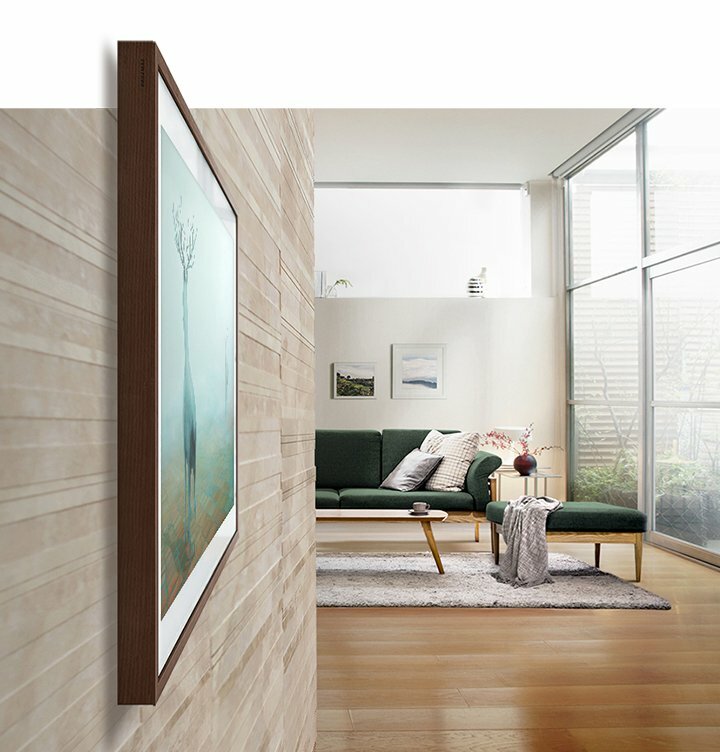 Rated 3 out of 5 by Ontik Beautiful design and feature; average picture I only buy premium TVs so the bar is set pretty high - take this review with a grain of salt. My other two TVs are LG OLED and Samsung QLED. I paid almost identical price for my 65 inch LG OLED (on sale) and this 55-inch frame TV. While the design and frame is very impressive; the picture quality was a huge disappointment. 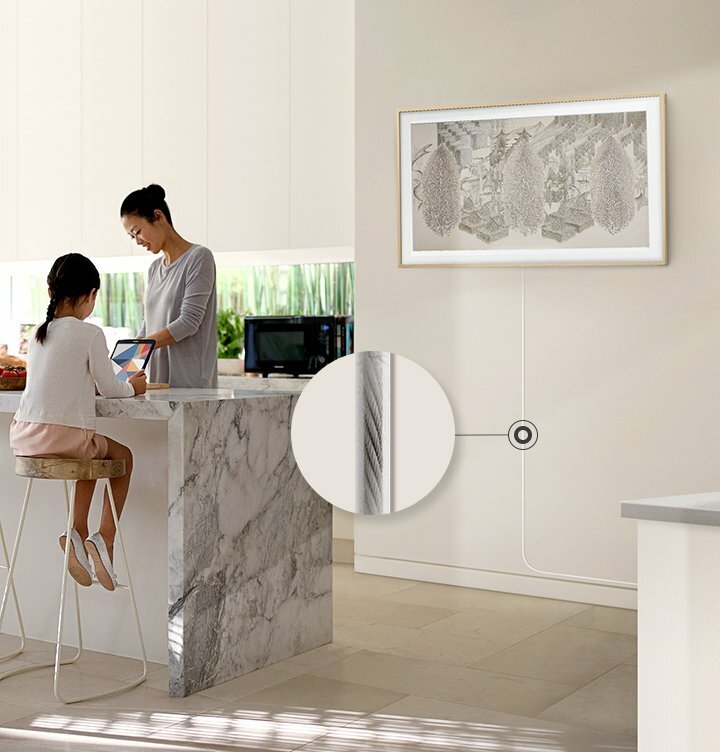 The TV comes with a one connect box, 'almost invisible' connection cable, a white-minimalistic remote and a mount. The mount was impressive as it allows a little bit of imperfection and you can adjust the tv after hanging it. Looks beautiful in art mode but quality of picture is nowhere near Samsung's premium QLEDs; let alone LG's OLED. Sound quality is subpar too. You will also have to be very careful with the one connect cable as it's very fragile and prone to breaking. I believe my cable is already closing to a breaking point as my one connect box sits on the edge and the slight weight of hanging wire has already left a notch on the base of the cable connector - replacement cables cost hundreds of dollars. In short, you're getting a non-premium TV at a premium price point and you're mostly paying for the design and aesthetics of this TV. In all fairness, this TV should not be priced in access of $1000. Rated 5 out of 5 by Hcl3 An upgrade to my previous tv! We just bought this tv and it is so nice. It was easy to set up and I love that you can use your phone as the remote. The One Connect Box is convenient because you can hide it behind the tv or put it away in a tv console. It was easy to plug everything into the box instead of behind the tv. Art Mode is great too! I just uploaded my own photos and now my tv doubles as a picture frame. The picture quality on the tv is a huge upgrade to my previous tv and I love that Netflix, Hulu, and YouTube are accessible from the remote. I really like this tv and it looks nice in my living room too. Rated 2 out of 5 by dotMorten No custom art supported Pretty TV but forget all about the custom art you can upload because Samsung still hasn't bothered to update their SmartView and SmartThings apps to support the 2018 line-up of TVs. I'm guessing they're trying to force you into the stupid and expensive Art subscription. Also the TV forces a bunch of apps on you that you can't uninstall. For instance Showtime and DirecTV apps which is useless of you don't have a subscription.